Labor rights activists have been protesting against sweatshops for about a generation, shaming multinational fashion brands for labor abuses and economic imperialism. Yet for all the petition drives and campus rallies, systematic labor exploitation still persists in garment factories across the Global South. But the power of the purse might succeed where the protests haven’t, as some government agencies wield their clout as “ethical consumers.” Pushing individual shoppers to buy sweat-free won’t necessary put a crimp in Wal-Mart’s supply chain, but activists are looking beyond the campus to city, town and state governments to promote conscientious contracting on a mass scale. Last month, to commemorate the anniversary of the deadly Rana Plaza factory collapse in Bangladesh, the city of Madison, Wisconsin, launched a contracting policy that commits the city’s vendors to promote fair labor standards. The city’s new “sweatfree” contract guidelines aim to eradicate labor abuse from its international supply chains for the production of government uniforms, including the apparel worn by firefighters and other agency personnel. The guidelines build on the city’s existing sweat-free procurement policies, with disclosure and monitoring mechanisms that aim to “[raise] the bar for human rights due diligence in government contracting” by providing a nationwide model, according to the advocacy network Sweatfree Purchasing Consortium (SPC). 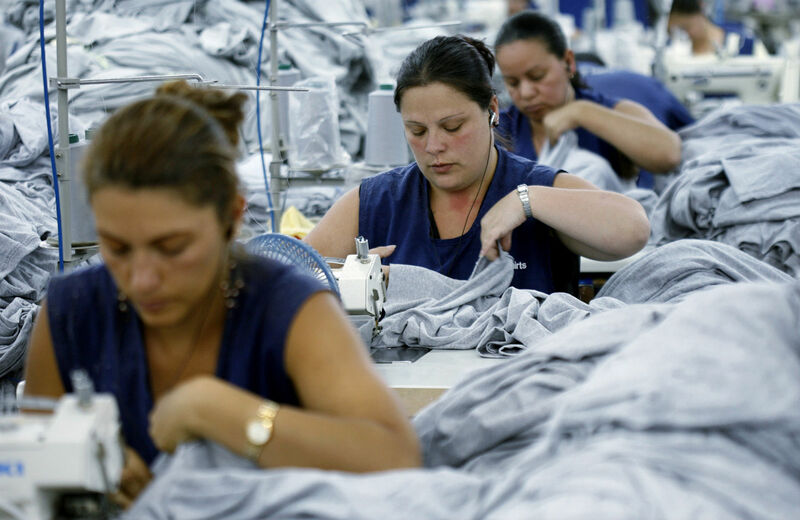 Similar to living-wage policies for workers on government contracts—which help raise pay scales for low-income workers across the community—the sweat-free contract model for government purchasing can promote standards for more ethical manufacturing across the global apparel market. Madison’s effort builds on model policies developed by advocates and governments of various cities and states through the SPC, which includes Austin, Berkeley and Maine. The Madison contract rules cover basic labor protections that reflect International Labour Organization standards. Vendors will be required to disclose detailed information on the entire supply chain, allowing city authorities to oversee factories’ compliance with national rules on wages and benefits, child labor, employment discrimination and maternity leave, fire and building safety codes, and overtime and maternity leave rules. Vendors will be monitored by a Contract Review Panel that includes representatives of the city and international labor experts. And if contractors do not have full disclosure for all their suppliers initially, they must increase disclosure levels annually over the duration of the contract. Suppliers will also be screened on whether they provide “worker education” and “a grievance process” to help them advocate for their rights at work. There is a special focus on “prevention measures to address health and safety conditions in high-risk areas such as Bangladesh and Pakistan”—two countries associated with “deathtrap” factories that have claimed the lives of hundreds of workers in recent years. The language mirrors provisions of the Bangladesh Accord, an industry-based program for factory health and safety that now has now enrolled about about 170 brands and retailers worldwide. Like the Bangladesh Accord, the Madison plan will be financed by the participating firms. Contractors are explicitly required “to fund independent monitoring of suppliers and factories where there is a high risk of violations.” However, the funds are spent not directly by the contractors but through the city of Madison, to prevent the kind of corruption that has become widespread in “corporate social responsibility” programs, which have been widely criticized for using sham audits to polish brands’ reputations. Government-led initiatives to buy products in decent conditions are different from industry initiatives in one critical respect: the standards are mandatory, not voluntary. Government buyers can contractually enforce the standards and the actions that contractors must take to comply with the standards. A company can choose to live by its own code of conduct or not, choose to remedy violations in its supply chain or ignore them. As a government contractor that same company can be sanctioned if it does not comply with the terms of the contract. The sweat-free contract model could work on a federal level as well. Stronger procurement standards could help resolve recent contracting scandals involving agencies’ use of factories linked to labor abuses including the Pentagon’s use of sweatshop labor to make military-branded fashions that are sold to civilian consumer markets. The Marine Corps has moved to incorporate guidelines of the Bangladesh Accord into its procurement rules. But Congress has failed to pass legislation to impose this standard across all branches of the military. Activists have long pushed for stronger federal procurement rules that marshal the government’s full purchasing power to set higher standards in the industry, rather than rely on individual agencies to set their own policies. For now, states and cities are moving ahead of Washington in incorporating ethical principles in their supply chains. If more communities adopt model policies like Madison’s, local governments can collectively raise the bar on global labor rights by consolidating their economic clout in a notoriously exploitative industry. With the government’s leverage as both a consumer and a steward of the public trust, the public sector can hold the line against the fashion industry’s race to the bottom.